April is a strange time to visit a botanical garden, since there are no blooms to enjoy. Yet, if you look closer, vestiges of last year remain in tones of brown, gray, and yellow. Yet, amid shrivelled shells and dried branches, hints for life begin to emerge. I can’t recall the variety of tree that this is, but the bright yellow skeletons of last year’s blossoms glowed in the sun and drew my eye towards them. It was not till I looked closer that I saw the fresh green buds beginning to show, reminding me not to allow first appearances cloud my vision in all aspects of life. Nature has so much to teach us. This entry was posted in Landscape, Nature, Photography, Plants & Flowers and tagged botanical, bright, gardens, lessons, Nature, Niagara, Niagara Tourism, notice, perception, spring, Tree, vision, yellow on April 29, 2016 by Ed Lehming Photography. An interesting side entrance to Notre Dame Cathedral in Montreal. It would appear the door was added as an afterthought. This entry was posted in Cityscapes, Photography, Thursday Doors, Travel and tagged #ThursdayDoors, cathedral, Door, Ed Lehming, Montreal, Notre Dame, photography on April 28, 2016 by Ed Lehming Photography. As I stood at the base of the Whitevale Dam, watching the trout spawn, I noticed this little bird, perched atop a broken tree limb sticking from the water. It sat there, surveying its world for quite some time. Was it simply pausing for a moment from the busy task of nest building. I’m certain it was not lost, though it was looking all around, perhaps for a suitable place to start, for as the quote above states, the bird knows where it belongs. This entry was posted in black and white, Nature, Photography and tagged bird, black and white, Ed Lehming, looking, love, Michael Bassey Johnson, nest, Nikon D300, pause, photography, safety, search, Whitevale on April 28, 2016 by Ed Lehming Photography. “Seeing all life in perfect symmetry. Perceiving each day with righteous clarity. Living each moment in purposed reality. A unique way of looking at this heavily travelled bridge between Canada and the USA at Niagara Falls. I’ve driven across this bridge many times and sat, lined up, for what felt like an eternity, at the border checkpoint both going to the US and returning home to Canada. With all the security on the surface of the bridge I was surprised at the complete lack, or apparent lack thereof, below the bridge. In fact, there is a beautiful walking/cycling path that I made this photo from, which allows you to see not only the details of the bridge supports but also the details and pathways on the far shore, which I had never noticed before. This entry was posted in black and white, Photography, Travel and tagged balance, belief, black & white, border, bridge, Canada, Lewiston, Niagara, Queenston, river, S. Tarr, steel, symmetry, USA on April 27, 2016 by Ed Lehming Photography. Coltsfoot is a pleasant little flower that I look forward to each spring. It’s the first to bloom and many people mistake them for dandelions. When the coltsfoot blooms, spring is just around the corner. I found the beautiful poem above while looking for a quote suitable for this photo, which I touched up to look like a painting, Something I am quite fond of doing with some of my photos simply because I like the painterly look in some cases. That a poem about coltsfoot exists is quite delightful and I’m surprised more is not written about it, as it was and is considered a key medicinal plant for treating lung aliments. To the point where the coltsfoot symbol was used to designate a pharmacy not too many years ago. The latin name Tussilago farfara is derived from latin tussis, meaning cough, and ago, meaning to cast or to act on. This entry was posted in Art, Nature, Photography, Plants & Flowers and tagged Cecilia Matz, coltsfoot, Ed Lehming, first, medicinal, Nature, Nikon D300, ontario, painterly, photography, plants, spring, Tussilago, wildflower, windymon, yellow on April 26, 2016 by Ed Lehming Photography. The eyes are a bit too lifelike. 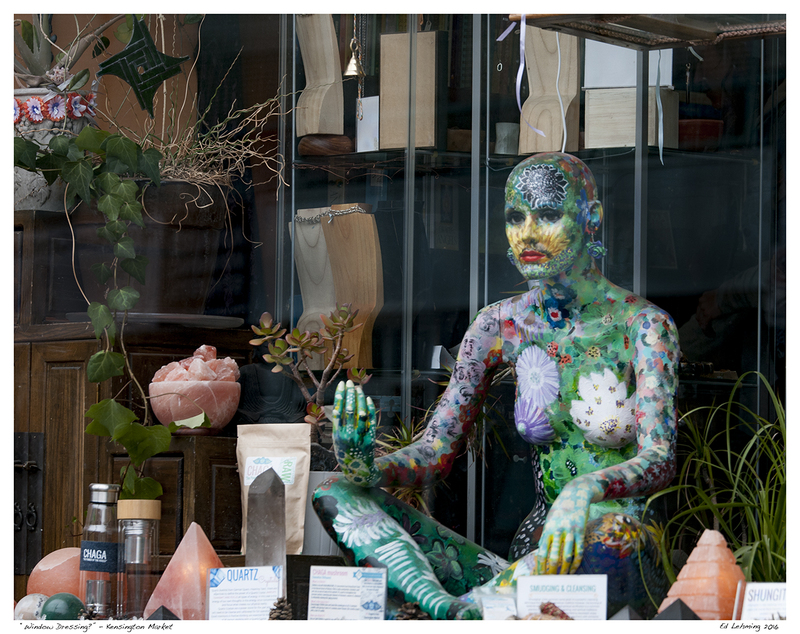 This entry was posted in Photography and tagged Ed Lehming, Kensington, Mannequin monday, Toronto on April 25, 2016 by Ed Lehming Photography.